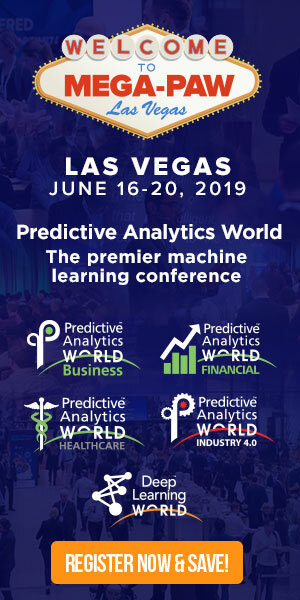 For today’s leading deep learning methods and technology, attend the conference and training workshops at Predictive Analytics World for Healthcare, June 16-19, 2019 in Las Vegas. A 49-year-old man notices a painless rash on his shoulder but doesn’t seek care. Months later, during a routine physical, his doctor notices the rash and diagnoses it as a benign skin condition. More time passes, and during a routine screening test, a nurse points out the rash to another physician who urges the patient to see a dermatologist. A dermatologist performs a biopsy of it. The pathology report reveals a noncancerous lesion. The dermatologist seeks a second reading of the pathology slides. This time, a drastically different verdict: invasive melanoma. The patient is immediately started on chemotherapy. Weeks later, a physician friend asks him why he’s not on immunotherapy instead. Albeit hypothetical, a version of this scenario plays out all too often in modern health care—not because of negligence, but due to sheer human fallibility and systemic errors. If done right, artificial intelligence could drastically reduce both systemic glitches and errors in the decision-making of individual clinicians, according to commentary written by scientists at Harvard Medical School and Google. The article, published April 4 in the New England Journal of Medicine, offers a blueprint for integrating machine learning into the practice of medicine and outlines the promises and pitfalls of a technological advance that has captivated the imaginations of bioinformaticians, clinicians and nonscientists alike. The vast processing and analytic capacity of machine learning can amplify the unique capabilities of human decision-making—common sense and the ability to detect nuance. The combination, the authors argue, could optimize the practice of clinical medicine. Machine learning is a form of artificial intelligence not predicated on predefined parameters and rules but instead involves adaptive learning. Thus, with each exposure to new data, an algorithm grows increasingly better at recognizing patterns over time. In other words, machine learning exhibits neural plasticity not unlike the cognitive plasticity of the human brain. However, where human brains can learn complex associations from small bits of data, machine learning requires far more examples to learn the same task. Machines are far slower at learning but have greater operational capacity and produce fewer errors of interpretation.